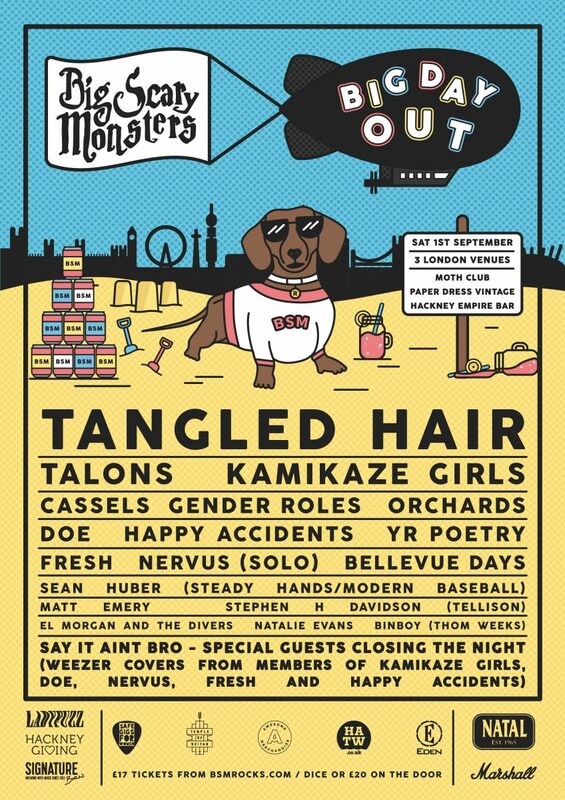 Big Scary Monsters Records are extremely pleased to reveal the final line-up for the inaugural BSM’s Big Day Out event, a huge celebration of the UK’s beloved independent music scene. Joining the final line up today are: Chipping Norton indie punk family duoCassels, the new project from members of Johnny Foreigner, Yr Poetry, Sean Huber of Modern Baseball/Steady Hands, and Binboy aka Thom Weeks from Gnarwolves. There will also be a very special appearance from Say It Ain’t Bro—a Weezer covers supergroup featuring members of Kamikaze Girls, Doe, Nervus, Fresh and Happy Accidents—to close the night in style. The whole events ends with the official after party, with Heads Above The Waves DJs playing until 3am at Paper Dress Vintage. In addition to all this, Signature Brew will be providing lots of lovely liquid refreshment while Temple of Seitan offer all attendees a discount on their delicious vegan treats from their restaurant, just yards away from the venues. Pulling together twenty of the label’s favourite artists across three unique East London venues—Moth Club, Paper Dress Vintage and Hackney Empire Bar—on Saturday 1st September 2018, early bird tickets are already SOLD OUT, with general sale tickets (£17) on sale now alongside special merch and music bundles.